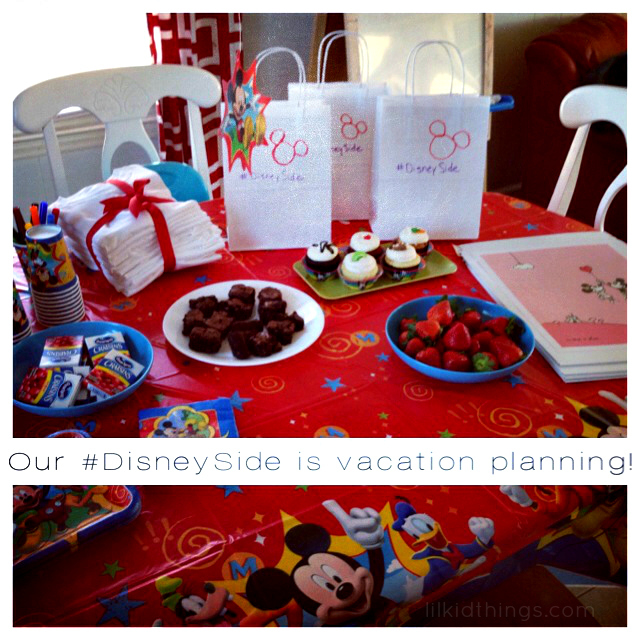 Home Disney TipsWalt Disney World	My #DisneySide is vacation planning! Anyone who knows me knows I am a major planner. I love the art of choosing. I research all my options in detail before making my final selections. I am like this across the board from buying baby gear to making dinner reservations. This is why I often request gift cards when people want to get me a gift. For me, the shopping is part of the fun! As you can imagine, planning our family vacations is like Christmas for me. The minute we decide to take a trip my brain is racing! This is especially true when it comes to taking my family to the Walt Disney World Resort. We love Disney and no matter how many times we go, there are always new things to explore or experiences we haven’t yet tried. Tis the season for vacation planning, so I recently had a some friends over for a Disney Side at home party to talk about our favorite Walt Disney World trip planning tips! If you are planning a vacation soon, I hope this post will give you some ideas and take some of the craziness of planning down a notch. I mean, the whole point is to have fun right?! If your head is spinning from all the options available to you at the Walt Disney World Resort, take heart. You are not alone! That’s why millions of people love going back again and again. There is no way to do everything in one trip, so let that take some of the pressure off! My first suggestion would be to start with this basic question, “Why am I going to the Walt Disney World Resort?” It seems like a no-brainer, but there are actually many possible answers to this question! See what I mean? This is why when you ask someone the best way to “do Disney” they will almost always answer with, “it depends”! This may seem overwhelming, but what it really means is there is something for literally everyone! Once you narrow down your reason for visiting the Walt Disney World Resort, you can get started with planning! One of my favorite resources for Walt Disney World planning tips is the Disney Parks Moms Panel. If you have a question, they can answer it! The Disney Parks Moms Panelists are regular parents (dads too!) who have planned their own vacations for years. They have personal experience along with an understanding of how to find the answers they may not know. And you can ask them anything for free! Answers are usually given within a day or two so if you don’t see your question answered already, ask away! In my experience, the beginning stages of planning a Disney trip can be the most fun and also the most overwhelming. With so many things to do, it can be hard to know where to start. This is where your top five comes into play. Start by choosing 5 things you are certain you want to do during your vacation by making sure everyone gets to do something they like. Based on the top five we have chosen for this trip, I am planning on a 5-night/6 day stay at Walt Disney World. This allows us to get a balance of rest and play time. Knowing what we want to do allows us to budget our costs effectively and make concessions in areas that aren’t as important to us for this visit. We will likely eat most of our meals in quick service restaurants and stay at a value hotel to counter the costs of the two nicer meals and the cost of the Halloween party tickets (which are sold separately). What are your top five? Start there and work backwards to find out the right selections for you. Check out My Disney Experience for ideas and events during your visit. I tend to value experiences over “things” so I don’t often come home loaded down with souvenirs. Still, there are a few things I like to get, like a new coffee mug or something I can use in the kitchen. With two young children, it can be tempting to get them everything they want, but it’s not necessary! 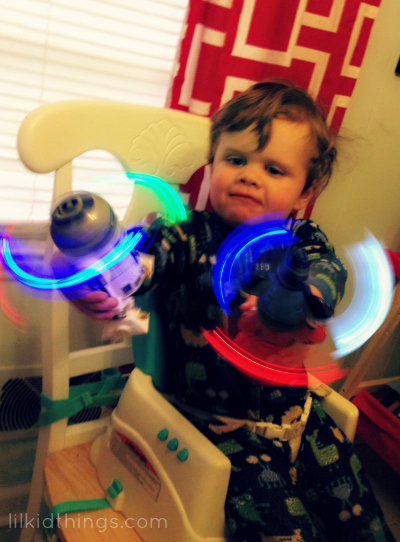 One thing they always seem to want are those light up toys that spin. They are everywhere at night in the parks and it seems like every single child has one but mine. On our last trip, we brought glow bracelets that I purchased ahead of time at the Dollar Tree. It was an easy fix, but there was just something about those spinners they love. When I traveled alone last month, I decided to get one to bring home to each boy from my trip. Now when we go in October, we can bring them with us (along with some extra batteries)! We will surely end up coming home with something Star Wars related for the boys and that is perfectly fine. I am not saying to get nothing to bring home, just make a plan and stick to it. You’ll be glad you did. Finally, because I love experiences and looking at our vacation photos after the trip, I make photo books using Shutterfly. They are so fun to look back on year after year. 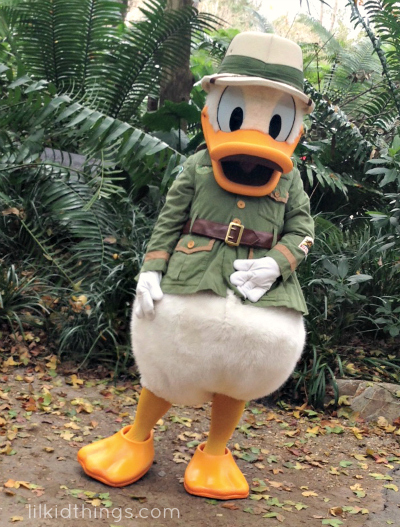 This year, I am excited to try out the new Memory Maker photo service at Walt Disney World. The cool thing about this service is that in addition to the regular Photo Pass photographers all over the parks, you also get ALL of the attraction photos! So that crazy face you made on Space Mountain or the laughing pic of your boy on Buzz Lightyear will be saved to your My Disney Experience account through the technology in you Magic Bands. You can view and download after you get home! The attraction photos are always my favorite, but purchasing them individually can really add up. I can’t wait to try Memory Maker! TIP: If you purchase Memory Maker before your trip, you save $50! Y’all, I could go on (and on and on), but I will stop here for now. As you can see, I really get into this stuff! I hope to do more posts about my Walt Disney World Resort planning ideas and tips. In the meantime, do you have any specific questions you would like me to focus on first? I’d love to help! Thanks for reading about my #DisneySide. Happy planning! Disclosure: I was provided with items to throw a #DisneySide party including a few goodies to share with my guests. All opinions are my own!